Chromium stimulates the activity of enzymes involved in the metabolism of glucose for energy, the synthesis of fatty acids and cholesterol and also contributes to the maintenance of normal blood glucose levels. Zinc improves cell health, and is essential for the structure of enzymes necessary for insulin to bind to cells so that glucose can be utilised for energy. Zinc also contributes to normal carbohydrate metabolism. Copper is combined with zinc to prevent a possible risk of copper deficiency during long-term usage as they compete for the same absorption sites. 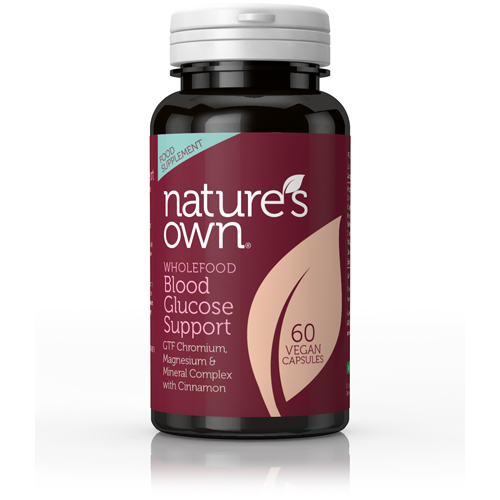 Cinnamon is included in this formula as it helps regulate blood sugar and supports the action of the other nutrients in this supplement. Extracts from the bark of the cinnamon tree have been used traditionally as medicine throughout the world. This supplement uses pure, real cinnamon with no detectable levels of coumarin. Cinnamon facilitates glucose use in humans, enhances insulin sensitivity and uptake into muscle cells. Magnesium bisglycinate, Hydroponically grown cruciferous vegetable (brassica Juncea) providing naturally-occurring: iron, zinc, manganese, selenium, chromium and vanadium; capsule shell (vegetable cellulose); cinnamon extract; vegetable stearic acid; di-calcium phosphate. Take 1-2 vegicaps daily with food, or as directed by a practitioner. 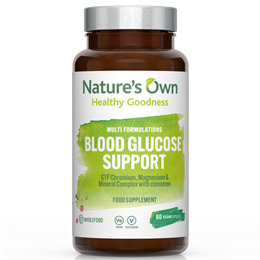 Below are reviews of Natures Own Blood Glucose Support - 60 Vegicaps by bodykind customers. If you have tried this product we'd love to hear what you think so please leave a review.